The lower Coos watershed is characterized by seasonal weather patterns, including comparatively warm, dry summers and cool, wet winters. Summer is characterized by consistently high winds from the north. Winter winds originate from the south and, while they are lighter on average, gusts from winter storms bring the highest wind speeds year-round. While no underlying long term meteorological trends in the project area are apparent, additional analyses are needed. Figure 1. Location of meteorological (weather) stations in the project area. This data summary discusses the meteorological characteristics of the lower Coos watershed by describing the following: air temperature, precipitation, wind, and Photosynthetically Active Radiation (PAR). Data came from several meteorological (weather) stations in the project area (Figure 1), but for a number of reasons (see Chapter Summary), emphasis is given to weather data collected at the North Bend Municipal Airport. We analyzed available data to describe both recurring seasonal patterns in the project area, and any underlying long term trends occurring independently of seasonal weather patterns. See Table 1 for questions addressed. The median annual temperature in the project area is approximately 50.9° F (10.5° C), based on data from the weather station at the mouth of South Slough (Figure 1)(SWMP 2015). Air temperature data display a clear seasonal pattern with summertime temperatures above the annual median and wintertime temperatures generally below the median (Figure 2). Mean monthly low temperatures range from 40 – 53° F (approximately 4.4 – 11.6° C), while mean monthly highs range from 53 – 67° F (11.7 – 19.6° C), based on data from the North Bend weather station (Figure 1)(WRCC n.d.)(Figure 3). Mean monthly precipitation in the project area varies from 0.5 to 11.5 inches (14 to 289 mm)(WRCC n.d)(Figure 3). Not surprisingly to those who live in the Pacific Northwest, precipitation displays a clear seasonal pattern: much more precipitation occurs in winter months than summer months. Also unsurprisingly, the magnitude of precipitation events show strong seasonal patterns. The probability of occurrence for both large (more than 1 inch in 24 hours) and small (0.01 – 0.25 inches in 24 hours) precipitation events decreases during the summer months (WRCC n.d)(Figure 4). Figure 6. 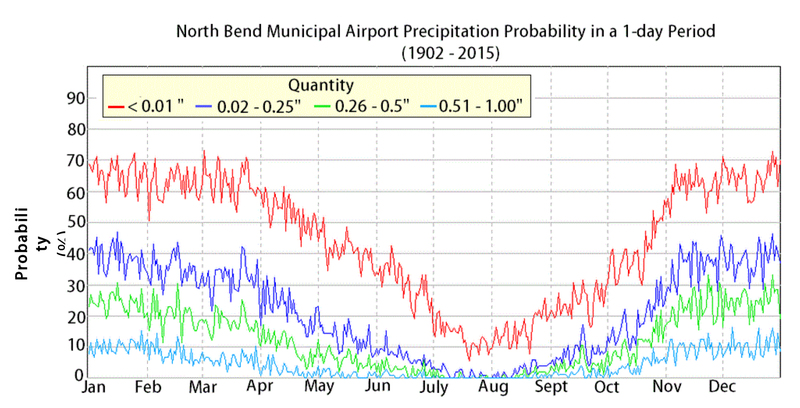 Speed and direction of sustained winds at the North Bend weather station (1997-2015). Wind direction is indicated by the underlying compass rose, with each spoke representing 10° (i.e., 9 spokes between cardinal directions). Wind speed is indicated by color, with darker colors representing higher wind speeds. Concentric rings around the center of the compass rose indicate the percentage of data coming from each wind speed category. Each ring represents 2% of all observations (see January for labels). Data: MesoWest 2015 using data package created by Carslaw and Ropkins 2012. Refer to the segment labeled “Ex.” (outlined in yellow, in January) for the following example: winds coming from 150° S at 10-14 mph represent about 4% of all January winds, because the length of this segment spans approximately 2 concentric rings. Table 1. This data summary describes seasonal variation in local meteorology and looks for underlying long term trends in the data. Examples of research questions pertaining to these two topical approaches have been provided for clarification. Wind speed in the project area is summarized by Table 2 and Figure 5. Wind speed data come from MesoWest (2015). The lower Coos watershed experiences sustained winds of up to 50 mph year-round, with an average annual wind speed of approximately 12 mph. Wind gusts exceed 65 mph, with an annual average of about 26 mph. 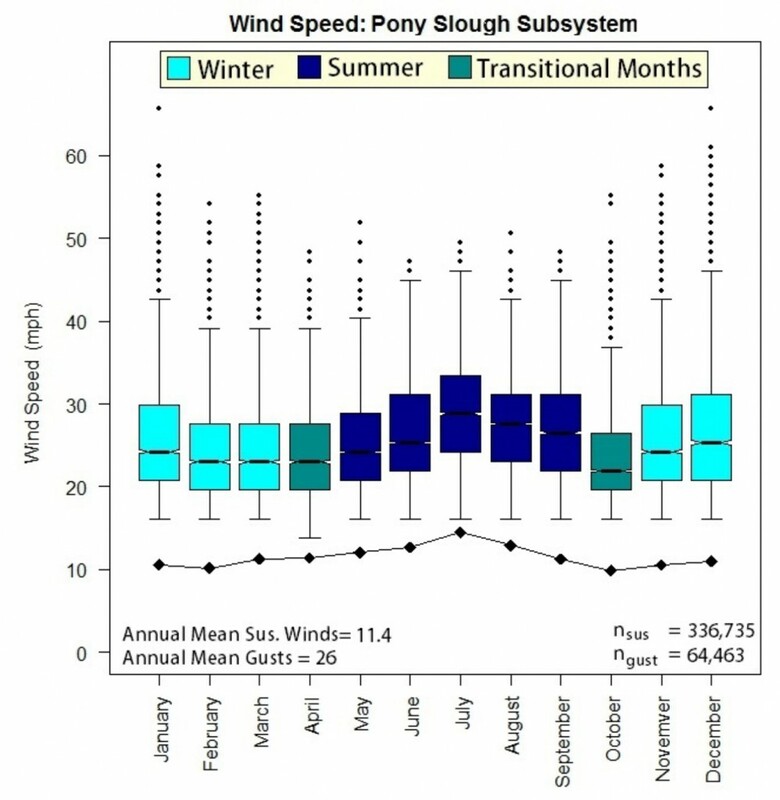 The average speed of sustained winds varies seasonally, with both the highest average and maximum sustained wind speeds occurring in the summer months (i.e., June, July, and August). 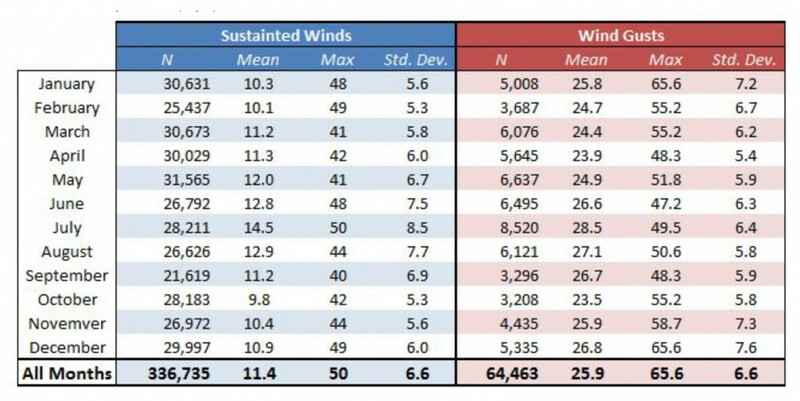 The average speed of wind gusts (i.e., monthly mean) also appears to be highest during summer, but it should be noted that both the variance (i.e., standard deviation) and maximum speed of wind gusts is higher in the winter. This trend suggests that summer is characterized by both high sustained winds and consistently strong gusts while wintertime winds, which are lighter on average, are subject to more variation in the form of intermittent storm events associated with anomalously strong wind gusts. Figure 6 summarizes the distribution of wind direction data at the North Bend weather station (MesoWest 2015). Winds in the project area originate from the north, south, and the west, but rarely come from easterly directions (i.e., between approximately 30° and 130°). High winds (i.e., sustained winds 35-50 mph) generally come from the north, with high southerly winds occurring less frequently. Generally, winter months are characterized by south winds of approximately 10-11 mph on average, with high wind events occurring from the southwest associated with winter storms. By contrast, the mean monthly wind speed increases to approximately 12-15 mph in the summer months, when the prevailing wind direction switches to the north. April and October appear to be “transitional months” that display some characteristics of both winter and summer winds. Table 2. Wind speed at the North Bend weather station (1997-2015). All speeds are reported in miles per hour. Figure 3. Average daily temperature from the North Bend weather station (1981-2010). Mean daily low temperature (blue) is plotted against mean daily high temperature (red) and mean daily precipitation (green). Periods of warm temperatures occur during the summer months, when average daily precipitation is low. Winter is characterized by cooler temperatures and increased precipitation. Data: WRCC n.d. Figure 4. Probability of indicated precipitation quantity in a 1-day period. Data: WRCC n.d. PAR measures solar radiation available to plants for photosynthesis (see sidebar below). PAR data from the North Bend weather station suggest that average daily PAR varies seasonally, with the highest daily mean occurring, not surprisingly, during summer months (Figure 7). PAR also appears to vary on a daily basis depending on the seasonal changes such as the length of the “photoperiod” (i.e., daylight hours) as well as other factors (e.g., cloud cover)(Figure 8). In order to analyze the data for underlying long term trends, this data summary makes use of “time series decomposition” where the data are robust enough. 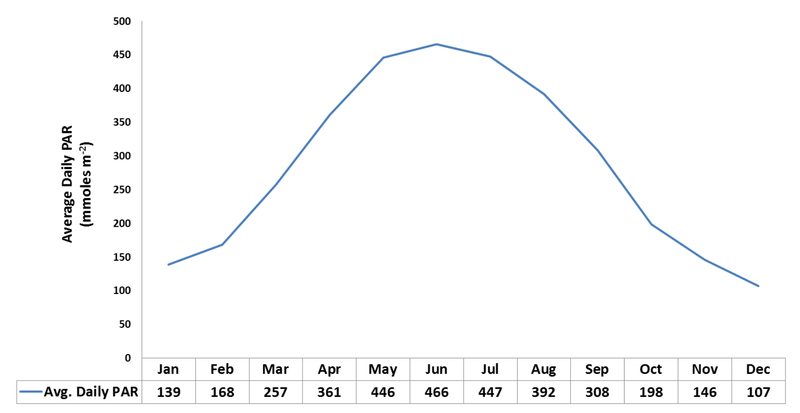 This statistical technique highlights trends by controlling for both seasonal variation and statistical “noise” in the data (see sidebar below). Decomposition of both air temperature and precipitation series yield no immediately apparent trend (Figures 9 and 10). Similar analyses were not conducted for wind or PAR, because the size of these data sets (18 years for wind and 7 years for PAR) is not conducive to analysis of long term trends. However, visual inspection of the available PAR data suggest that, although PAR is highly seasonal, there does not appear to be any significant change in PAR over time (Figure 11). It’s important to note the information presented in this data summary is subject to data limitations. More analysis is needed to determine how meteorological patterns may or may not have changed in the project area over time. 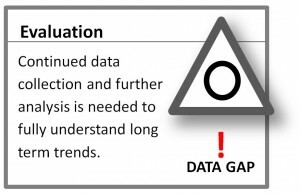 For a discussion of data limitations, see the Chapter 8 summary. Due to the data limitations mentioned above, it is difficult to determine whether the intensity of storms in the project area has changed over time. Similarly, it is also difficult to assess overall trends in climatic variability (i.e., magnitude of changes in temperature, precipitation, etc.). Decomposition analysis shows no apparent trend in the variance of either air temperature or precipitation over time, when controlling for seasonal effects and statistical noise (Figures 12 and 13). However, more detailed data and additional analyses are needed to fully understand how extreme weather events and climatic variability in the project area may have changed over time. Photosynthetically Active Radiation (PAR) measures the amount of light in the 400-700 nanometer wavelength range. Light in this wavelength range is readily available for plants to use in photosynthesis, the process that allows them to convert sunlight to energy for growth. PAR is commonly reported in units of millimoles per square meter (mmol m2). PAR values vary depending on several factors determining light availability (e.g., season, latitude, time of day, cloud cover). High PAR levels promote plant growth. The continued monitoring of PAR ensures that local land managers have the information they need to track long term changes in climate-related light levels that may affect agricultural, habitat conservation or restoration operations. There are three components to seasonal time series data: 1) seasonality (a recurring pattern influenced by seasonal factors); 2) trends (overall increasing or decreasing pattern); and 3) statistical “noise” (variations in the data that cannot be identified as either seasonality or trends). Seasonal time series relationships can be complicated and may require the use of special analytical techniques to adequately describe. For example, seasonality data and statistical noise can obscure an underlying trend. Statisticians are able to examine time series data for underlying trends by “decomposing” the series into its component parts and controlling for both seasonal effects and statistical noise. This data summary highlights the underlying trend of meteorological time series data by simultaneously “smoothing” statistical noise and “seasonally adjusting” a series. This technique isolates the trend component of a time series and allows for a clearer presentation of any underlying pattern not dependent on seasonal variation. Figure 9. Seasonally adjusted long term air temperature trends (1931-2014) for both maximum daily temperature (red) and mean daily temperature (blue). Raw data (green) have been controlled for both seasonal effects and statistical noise. Linear regression of seasonally adjusted trend on year suggests that temperature change over time is not statistically different from zero (i.e., no change) when controlled from seasonal variations. Data: WRCC n.d. The world’s oceans play a critical role in determining climate conditions of coastal environments by absorbing and distributing solar radiation, fueling the hydrological cycle, and generating storms (Boesch et al. 2000). 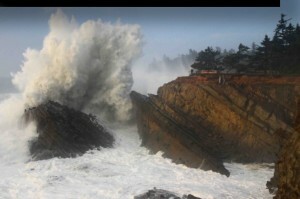 Rumrill (2008) explains that two ocean environmental factors influence climate over the Pacific Northwest, the Oregon coast and Coos Bay: Large-scale variability in atmospheric pressure over the northern Pacific Ocean (Pacific Decadal Oscillation- PDO), and cyclical patterns in nearshore ocean currents. The relationship between PDO and meteorological patterns in the project area (data from the North Bend weather station), suggest that a weak but positive correlation between these two factors exists (Figure 14). The cool, southerly California Current system is the predominant oceanographic feature that influences climate between Cape Mendocino, California, and the mouth of the Columbia River, which includes the project area. The California Current is about 500-750 mi (800-1,200 km) wide and generally flows south at a rate of about 2.5-5 mi (4-8 km) per day. In summers, a narrow, deep current (the California Undercurrent) flows northward at depths below 650 ft (200 m)(Halpern et al. 1978 as cited in Rumrill 2008). It is relatively fast and flows at a rate of 4-10 mi (6-16 km) per day (Rumrill 2008; Mysak 1977; Collins et al. 2000). From late August to October the nearshore component of the California Current weakens, although flows remain in a southerly direction farther offshore (Briggs 1974 as cited in Rumrill 2008). From November through February the swift Davidson Current flows northward at a rate of about 5.5-12.5 mi (9-20 km) per day, at all depths, across the continental margin between the California Current and the shoreline. The Coos estuary is exposed to the full force of Pacific Ocean storms when winter winds begin to blow in November. These produce large swells and push rain and moisture inland, generating enormous waves that can cause significant erosion as well as sediment movement and deposition. During the transition to spring (April-May) the offshore winds become northwesterly and generally remain so through the summer and early fall. Northwesterly winds trigger the spring-summer upwelling pattern, which can modify coastal climate and biological productivity. When strong northwesterly winds persist for several days, surface waters near the coast are pushed west by the rotation of the Earth, away from shore. The offshore flow causes cold, nutrient-rich water from the deep ocean to well up near the shore. Although the most active upwelling is restricted to a narrow band approximately 5-15 mi (8-24 km) from shore, upwelling greatly influences currents across the entire continental shelf. 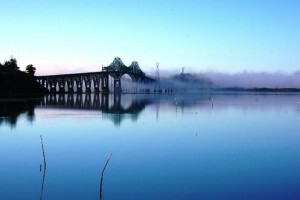 Upwelling also modifies the summer climate, causing coastal fog that can persist onshore for days or weeks when “upwelled” cold ocean waters meet warm, moist air. Upwelling contributes to high levels of biotic productivity throughout the region. Indeed, the rates and volumes of upwelling observed between Cape Mendocino and the mouth of the Columbia River are greater than anywhere else along the west coast of North America. While upwelling tends to be strongest between Cape Mendocino and Cape Blanco, evidence of upwelling is demonstrated by the patchy distribution of temperate faunal communities as far south as the northern coast of Baja California (Rumrill 2008). Figure 10. Seasonally adjusted long term precipitation trend (1931-2014) for total monthly precipitation (blue). Raw data (green) have been controlled for both seasonal effects and statistical noise. Linear regression of seasonally adjusted trend on year suggests that precipitation change over time is not statistically different from zero (i.e., no change) when controlled from seasonal variations. Data: WRCC n.d. Figure 12. Variance of raw air temperature data (green) plotted against seasonally adjusted trend for variance of both mean daily temperature (blue) and maximum daily temperature (red). Data show no clear trend in variance and linear regression (black) since 1931, which suggests that the change in variance over time is not statistically different from zero (i.e., variance remains unchanged over time). Data: WRCC n.d. Figure 13. Variance of total monthly precipitation (green) plotted against seasonally adjusted trend (red). Data show no clear trend in variance of monthly precipitation and linear regression (black) since 1931, which suggests that the change in variance over time is not statistically different from zero (i.e., variance remains unchanged over time). Data: WRCC n.d.
Boesch, D.F., J.C. Field, and D. Scavia, (Eds.) 2000. The Potential Consequences of Climate Variability and Change on Coastal Areas and Marine Resources: Report of the Coastal Areas and Marine Resources Sector Team, U.S. National Assessment of the Potential Consequences of Climate Variability and Change, U.S. Global Change Research Program. NOAA Coastal Ocean Program Decision Analysis Series No. # 21. NOAA Coastal Ocean Program, Silver Spring, MD. 163 pp. Briggs, J.C. 1974. Marine Zoogeography. New York: McGrawHill. 475 p.
Collins, C. A., N. Garfield, T. A. Rago, F. W. Rischmiller, and E. Carter. 2000. Mean structure of the inshore countercurrent and California undercurrent off Point Sur, California. Dee-Sea Research II 47: 765-782. Halpern, D., R.L. Smith, and D.K. Reed. 1978. On the California undercurrent ver the continental shelf off Oregon. Journal of Geophysical Research 83: 1366-1372. Mysak, L.A. 1977. On the stability of the California Undercurrent off Vancouver Island. Journal of Physical Oceanography 7: 904-917. Rumrill, S. 2008. 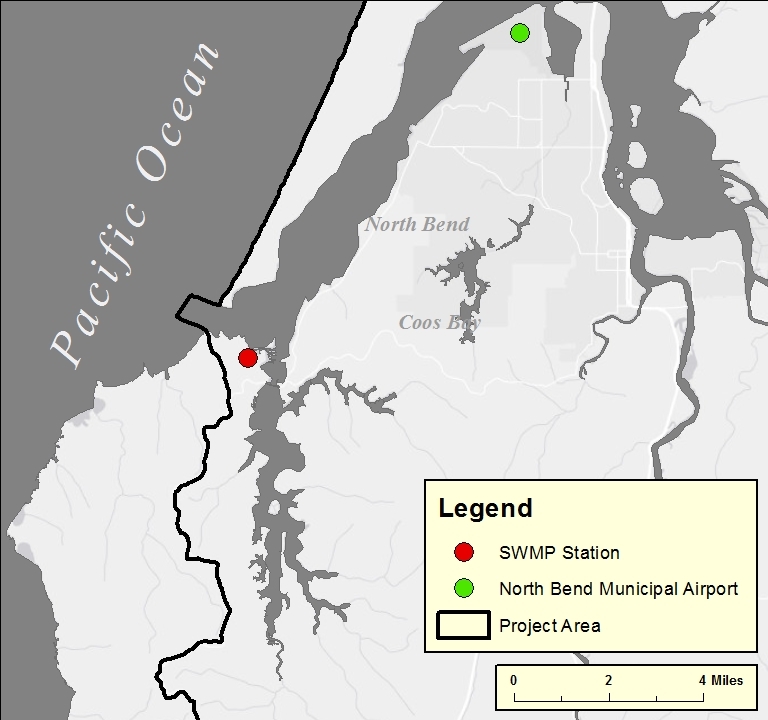 Ecology of the South Slough Estuary—Site profile of the South Slough National Estuarine Research Reserve.